Before we start, I’ve created a Facebook Event page for #CrashCityHall this Friday. Please spread the word to everyone you know so we can get as good a turnout as possible. And be sure to read the open letter to City Hall written by Raquel Jorge. Come back later today, when we’ll post another by Doug Moore. Thanks to everyone who sent me items to post over the weekend. I’d like to thank you individually, but frankly, it’s four in the morning as I finish this up and I keep falling asleep as I type. So please accept my apologies and my gratitude. Still more Bike Week Events. CICLE is hosting a ride to A Taste of Pasadena tonight. 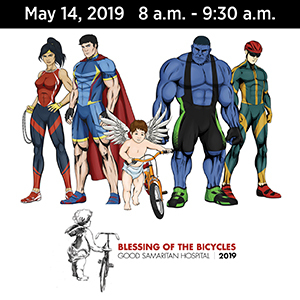 My favorite Bike Week event takes place bright and early tomorrow morning with the annual Blessing of the Bicycles at Good Samaritan Hospital. This year the prestigious Golden Spoke Award goes to LA Metro for their leadership on bike projects in recent years. 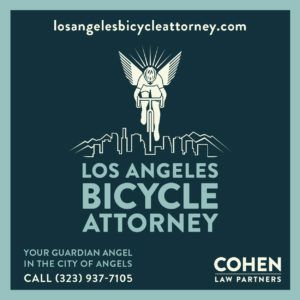 West Hollywood is giving away free bike lights at Santa Monica and Vista tomorrow night, and hosting a Bike to Work pitstop on Thursday. Westwood’s Hammer Museum is hosting a talk Wednesday evening on how to move LA to a decarbonized future. The annual Pasadena Ride of Silence around the Rose Bowl will roll at 6:15 pm this Wednesday. Ride free with your bike on Metrolink this week, or ride free on El Monte’s transit system with your bike or helmet. 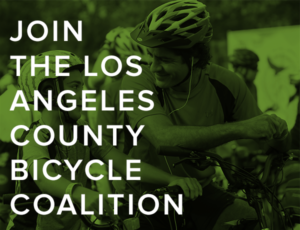 KTLA-5 talks Bike Month with the LACBC’s departing Executive Director Erik Jansen. Elon Musk says you’ll be able to take a free ride through his new Boring tunnel under the Westside within a few months. No, really, he seems to be serious. No word west on whether you’ll be able to take your bike with you, as he previously promised. The LA Times recommends walking or riding in the Upper Las Virgenes Canyon Open Space Preserve in the West San Fernando Valley. La Verne is creating its first active transportation plan and planning for bike lanes. Which is about time, since the city currently doesn’t have any. A Long Beach resident describes what he has to go through as a black man just to walk in his own neighborhood. Orange Coast College is easing a ban on skateboards and rollerblading after installing a dedicated bike path to encourage students and staff not to drive to campus. It’s long past time for all schools and businesses to remove needless barriers to active transportation. And that includes dangerous roads along the way. A San Diego councilmember wants to ban e-scooters from the Mission Beach boardwalk, accusing users of turning it into a human slalom course. Wired says the vehicle of the future is a bicycle. A writer for Medium says that a real commitment to Vision Zero could result in more than just fewer deaths. As if that wasn’t enough. Men’s Journal list the top five commuter bikes for 2018, only one of which sells for under $1900. Gear Junkie answers all your questions about bike shorts. Including why you should go commando. Great idea. A Las Vegas school combines bicycling with support for education, sponsoring a ride in which bicyclists bring books to the school for kids to take home. An Arizona court rules that if you’re injured on streetcar tracks that meet design and engineering standards, it’s your own damn fault. 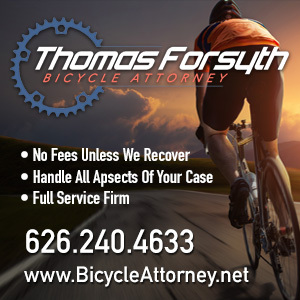 An Austin TX bicyclist was killed in a collision with a police officer responding to a call, after allegedly riding through a stop sign; his companion, who managed to get across the street safely, appeared to be under the influence. A Rochester NY cyclist says bike lanes terrify bicyclists and confuse drivers. A New York writer takes a ride on an ebike. And likes it. Yale alumni guide blind riders on tandem bikes through the streets of New York during the Five Boro Bike Tour. A DC rider learns the hard way that bicyclists depend on drivers to get home safely. Road.cc considers how to get your bicycling mojo back. Mexican officials reverse themselves, and say the Polish and German men recently found dead in a ravine were the victims of foul play, after one was found with a bullet wound; they were on an around-the-world bike tour when they were robbed and murdered in Chiapas. Ontario, Canada cyclists celebrate a coming road diet, while drivers inevitably try to stop it. Nova Scotia is working on updating its traffic safety laws for the first time in 100 years; a driver recently got away with failing to yield to a bike rider because bikes aren’t considered vehicles under their laws. The war on bikes continues, as a driver in the UK deliberately aims his van at a bike rider, then threatens to kill bicyclists after running the rider off the road. The top ten bicycling routes in Scotland, to add to your bike bucket like. A Scottish lawyer and bike advocate calls for presumed liability, saying it’s the only way to bring fairness back to the legal system and protect the rights of people injured in crashes. A British study concludes that the only way to prevent unsafe passing of bicyclists is to invest in separated infrastructure. The Irish Times says the government has a moral responsibility to invest in protecting bicyclists. Seriously? A seven-year old boy in the United Arab Emirates was taken into custody by police and interrogated for allegedly swerving his bike into traffic and causing a collision, before the court finally ordered him handed over to his father. Did I mention that he was just seven effing years old? Fifteen thousand bicycle cab operators in Kenya’s Busia County are trapped in the business, because they can’t make enough money to afford a motorcycle. One of the world’s top-ranked paracyclists is joining with eleven runners to travel nearly 1,400 miles from Cape Town to Pretoria, South Africa, by handcycle, less than four years after she lost the use of her legs in a cycling crash. A New Zealand truck driver says you never get over the pain of killing someone, even if the victim’s parents forgive you; he says he’ll never drive a truck again after he killed a man riding his bike last year. Canberra, Australia will test slowing traffic on some streets to protect bike riders and pedestrians. Singapore approves a new requirement for bike parking spaces in any new residential development, while saying fears it will force out car parking are unfounded. A Singaporean website questions whether pedestrians and personal mobility devices like e-scooters and hover boards can co-exist. In your spoiler-free report on Sunday’s first stage of the Amgen Tour of California, someone outsprinted his competitors to claim victory, while someone else finished second. The Tour of California will award equal prize money to both the men and the women, even if women cyclists are not yet allowed to compete on the same courses. And the race has done away with podium girls, allowing women to make the podium the same way the men do — by winning races. CyclingTips asks if an American can win the AToC, while Cycling News offers five riders to watch. Meanwhile, in an equally spoiler-free report from the Giro, it’s still going on. The BBC looks at how the world’s oldest BMX competitor was talked into trying the sport by her son. Britain’s Sean Conway set a new record for riding the full breadth of Europe, covering 3980 miles in 24 days, 18 hours and 39 minutes, beating the old record by nine hours. How can we miss Lance if he won’t go away? Going after the one hour record — on a Penny Farthing. And if potholes make the roads a deathtrap, putting a bell on your bike isn’t going to help.